Writer/director Gavin O'Connor (of Tumbleweeds, Miracle, Pride & Glory) is no stranger to presenting intense sports drama. The final moments of the central hockey event in his 2004 film Miracle is among the most intense sports moments in film history. With his latest film, the sensational MMA drama Warrior, though, he's off the ice and inside the cage. Centering on two brothers, Warrior is about a two-night mixed martial arts (MMA) tournament to determine who is the best fighter on the planet. But Warrior is much more than just men in a cage fighting, as O'Connor explains in our interview we conducted just this week. O'Connor is also no stranger to family drama as indicated by his other films, 1999's Tumbleweeds and 2008's Pride & Glory. 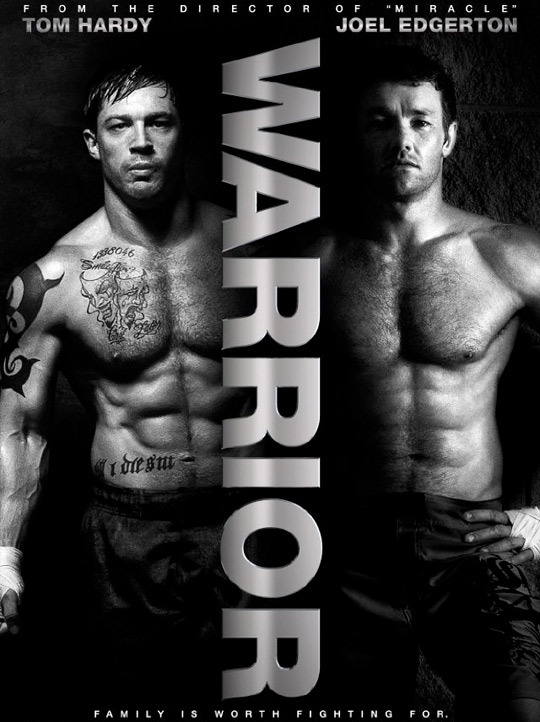 The two brothers in Warrior, played by Tom Hardy and Joel Edgerton, are estranged, unfamiliar to one another after years of the family being broken apart. The reason for that breakage is their father, played by Nick Nolte, who hopes to suture the tear he created years ago by training one son. We had the opportunity to speak with Gavin O'Connor regarding Warrior, the sport of mixed martial arts, and the two incredible lead actors involved in his film. So let's jump right into it! First off, just right off the bat, are you an MMA fan? Gavin O'Connor: I hope that my film is reflective of that. The movie is very much a love letter to a sport that I'm pretty passionate about. In a lot of boxing movies or movies about contact sports, you generally follow one character's journey, and that character is going against what some would consider the "bad guy". in Warrior, there are two characters you're rooting for equally. Talk about coming up with a balance in the screenplay and in the finished film between the two characters. Gavin: Well I think the most conventional, if you want to use the term sports films, is as you've presented, and I was just wanting to do something that we haven't seen before, which is offer an audience two people to root for, and then, as they are on a collision course to possibly fight each other you're rooting for both of them until they have to step into the cage and square off against one another. Then you ask the audience then, "Now how do you feel about this?" because this is obviously something you haven't emotionally experienced before in these films. And then the goal was that by the time the fight was over there's this unconscious thing where the audience realizes that the ending is both surprising and inevitable, because one brother needs to win to win and the other needs to lose to win. That was the intention. So the outcome of that, and we're not going to give it away, but that was never tossed about or debated? Gavin: You mean as to who would win? Gavin: No, because one of the brothers, what I was always going for was what I called an intervention in a cage where one brother saves the other brother's life by beating the hell out of him. So the idea was that one brother had to die metaphorically at the hands of the other brother in order to be reborn. I'm sure you had MMA advisors on the set, but talk about your preparation for filming MMA fights. Gavin: It started with - as a fan I've gone to a lot of UFC fights. Once I befriended a man named Charles Lewis, he opened up all the doorways for me in the MMA world, which led me to many different people. One of them being Greg Jackson, who is in my opinion one of the greatest trainers on the planet, and Greg became a technical adviser. Greg allowed me backstage to a lot of events. I was in locker rooms with Rashad [Evans] when he was going out to fight in championship fights and just watching him get taped up and the pre-fight psychology that went on. So I definitely had an insider's view of what happens before someone steps inside a cage. Talk a little about casting the leads, Joel Edgerton, Tom Hardy, and Nick Nolte, who gives one of the best performances of his career in Warrior. Gavin: Anthony [Tambakis] and I wrote the part for Nick, so it was always intended for him to play Paddy. He was one of the first people to read the script when we finished writing it. We offered him the part, and even when we were writing it he knew we were writing this piece for him. That came out of just my own friendship with Nick. We've known each other a long time, and I knew he was prepared to put his heart on the table and reveal all his vulnerabilities. There were things in his own life that we could tap into that would be reflective of the character. And in regards to Joel and Tom Hardy, there was an exhaustive search in the states for the right two actors that would encompass the qualities I was looking for, and then we opened it up to go across the pond, and we got to Europe and then Australia. It was a long search, but these two guys emerged, and they were very right for me outside the cage to start with. They had all the qualities I was looking for to inhabit the characters. Then, of course, the challenge was always in getting them to be able to pull it off inside the cage, and that required, beyond the athleticism I knew they had, especially Joe who did have a Karate background, the commitment I needed, the months and months of training that were required before we started shooting. So both actors went through a lot of training or preparation for their fights? Gavin: Oh, yeah. A lot of preparation. I surrounded myself with MMA guys, all the choreographers and coordinators were all MMA guys. A guy named J.J. Perry put the whole team together. We all took it very seriously. We all put a pretty high bar up there in regard to capturing the truth of the sport and keep the fighting grounded in a reality. I didn't want like a Hong Kong style of fighting or things like that. Where do you see films about contact sports, boxing or MMA, fitting in with films about team sports? I know some people might not consider boxing or MMA as sports, so I'm not sure if they would consider movies about boxing or MMA sports films. Gavin: I think there's something about one person stepping inside whether it's a ring or a cage and imposing his will on another person and not having to rely on anyone else but your own talents, your own desires, your own heart. It's such an individualized sport, and I certainly consider them both sports, but I think dramatically it's very different then the team environment. Still a lot of intensity in both. In your films, especially Miracle and now Warrior, in certain fights or the match in Miracle, there are moments that have a lot of intensity in the middle of this bigger fight. Do you start with that and then work your way out with the rest of the match or is it all laid out beginning to end? Gavin: What I'm always trying to do is approach it from character, so whether it's shooting hockey, shooting guys going up and down the ice on skates and you just figure out technically how you want to do that, but if you don't get an audience invested in the characters and then find all the emotional moments and drawing emotional lines between characters that you can excavate and go deep with within the context of the sport. I think then you're just missing an element to story-telling that is what people really go to the movies for. I don't think people go to the films to watch football or boxing, because you can watch it on television. I think it always starts with characters. The audience perception kind of leads into my next question. The trailer for this film shows the finals of this tournament. The audience knows they're watching a tournament, and they know that it's going to end with two guys fighting, but the trailer actually shows that it's the two brothers. Was that something you had a hand in? Gavin: I didn't. To be honest with you there was a long conversation I had with the studio, because I was concerned that they were giving the ending away, but the truth of the matter is, when they tested the trailer, one of the things they discovered was that people that saw the trailer as a test, when they filled out the questionnaire, the number one thing that made them want to see the movie was the idea of two brothers fighting each other. So what we were protecting then was who wins the fight. And the studio's point to me was we have to get people to come to the theater, so if we hold that, people won't go, and the movie could come and go quickly. It was a long conversation. It was a tough decision. There have been dozens of films about boxing over the years, but this is the first mainstream movie that deals with MMA, and now we're kind of at that cusp of MMA taking over boxing in the world of sports. Do you feel like MMA is a subgenre of film we'll be seeing more of? Gavin: I hope so. I was certainly aware of the fact that it hadn't been utilized in cinema in the way I was going for, so that was exciting to me. I probably could have made the two brothers boxers or wrestlers, but I didn't want to be in a long pantheon of great boxing films. I love the sport. I wanted to dramatize it in a way that I really believe hasn't been done before. So that was exciting to me. I also very aware that three years ago when we wrote the script it was the fastest growing sport in the world, and we just saw what happened with the deal the UFC just made with FOX, so it's starting to go more mainstream, and hopefully the movie just pushes it closer. Do you know if the higher ups at UFC have seen Warrior? Has Dana White seen the film? Gavin: I don't know. I don't know Dana, so I haven't spoken to him. I hope he does. In the movie we salute the UFC. We're not trying to say we're better than them. It's just that we're the tournament, so we're certainly not trying to compete with them, but I wanted to do something completely different from the UFC. I never contacted them and said, "I'm making this movie. Can I have your blessing?" or anything like that. Well I can't imagine they didn't love the film. Gavin, thank you very much for talking with us today. Thank you to Gavin O'Connor and Lionsgate Films for this interview with the director of one of the best films of the year. Warrior hits theaters this week. You can see a trailer right here!